With this month marking the 50th anniversary of the “War on Poverty,” we have seen a number of retrospectives. President Obama delivered this statement and the White House’s Council of Economic Advisors offered a 50-page report. Others chiming in include the Center on Budget and Policy Priorities, the Pew Research Center, and the Center for American Progress. The basic story: the social safety net programs of Medicare, Medicaid, Head Start, and food stamps have reduced deprivation over the past 50 years, but U.S. poverty remains quite high. A 2012 Economic Policy Institute report shows just how high. Using the standard international definition of poverty (household income of less than half the median), the study found, for example, that U.S. poverty was 17.3 percent versus Germany’s 8.9 percent and that 23.1 percent of U.S. children were in poverty, compared to Germany’s 8.5 percent. Moreover, U.S. taxes and transfers were found to reduce poverty less than in any of the other 22 countries studied. Two papers from National People’s Action—a group cofounded by anti-redlining activist Gale Cincotta—speak to this transformative possibility. One is a brief for a Long-Term Agenda to the New Economy and a second paper, titled Creating a Long-Term Agenda for Change: A Case History of National People's Action, lays out a “40-year plan” based on five principles: 1) Democratic control of capital; 2) Racial justice; 3) Reducing corporate power and restoring public purpose; 4) Renewing democracy; and 5) Ecological sustainability. Naturally, even as it adopts a broader vision, day-to-day work continues, such as fighting against exploitative bank deposit-advance loans. Turning long-term goals into actionable campaigns is challenging. 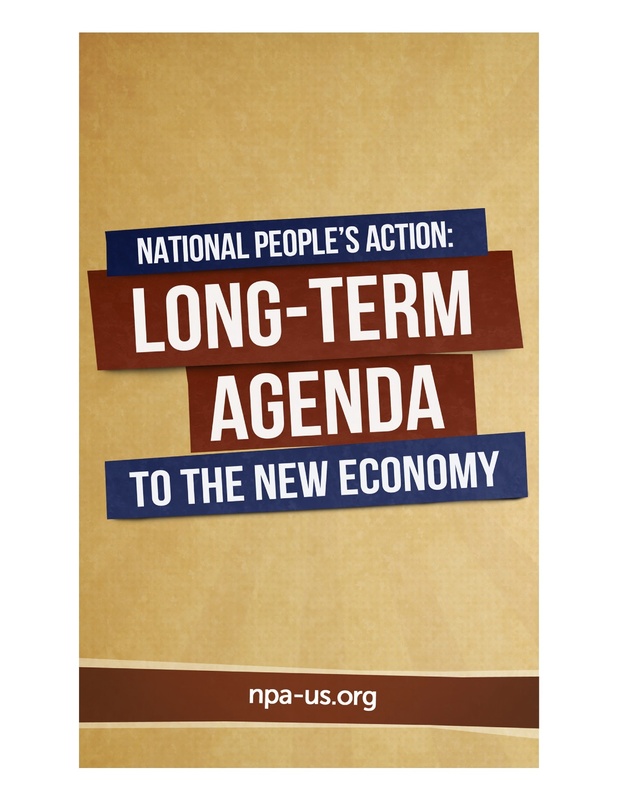 As NPA leaders George Goehl and Bree Carlson write, “reimagining what’s possible feels real and credible only when accompanied with a clear analysis of how structural reforms—reforms that take power away from the 1% and move power to everyday people—can lead to larger transformation.” Still, the vision helps guide community building work. Of course, NPA’s vision is not the final word. It has, however, set forth a position. Implicitly, it calls on us to do the same. So, what’s your 40-year plan?